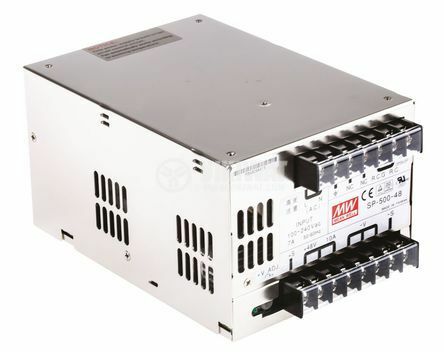 Switch power supply unit for all purposes applications with input voltage 100-240 VAC 50/60 Hz, outpuт voltage 48 VDC, output current 10 A and output power 480 W. The product possesses an EMI filter, surge and overload protection. The nominal power of the device must be 20-30% higher than the load capacity of the consumer at an active load (heaters, electric ovens, furnaces, stoves, incandescent lamps, etc.). This is due to the high starting current of the loads. When the load is switched on and during repeated short-time modes, the load over a short period significantly exceeds the nominal parameters specified in the load characteristics. When the device is used in conjunction with inductive load consumers, the power must be 3 to 5 times the power consumption of the load! (fluorescent lighting, electric motors, pumps, air conditioners, refrigerators and freezers, etc.). When the device is used for consumers with a capacitive load, the selected power must be 5 to 10 times greater than the power consumption of the load! (pulse chargers, LED drivers, pulse power supplies, etc.). If these instructions are not complied with, it is possible for the device to be overloaded and stop functioning, and the warranty will not cover the damage.